An established contemporary art gallery with a website that provides a neutral backdrop, bringing the artists and their works to the foreground. White Cube represents respected established and emerging artists from around the world, and hosts museum quality exhibitions in their three sites: London Bermondsey, London Mayfair and Hong Kong. 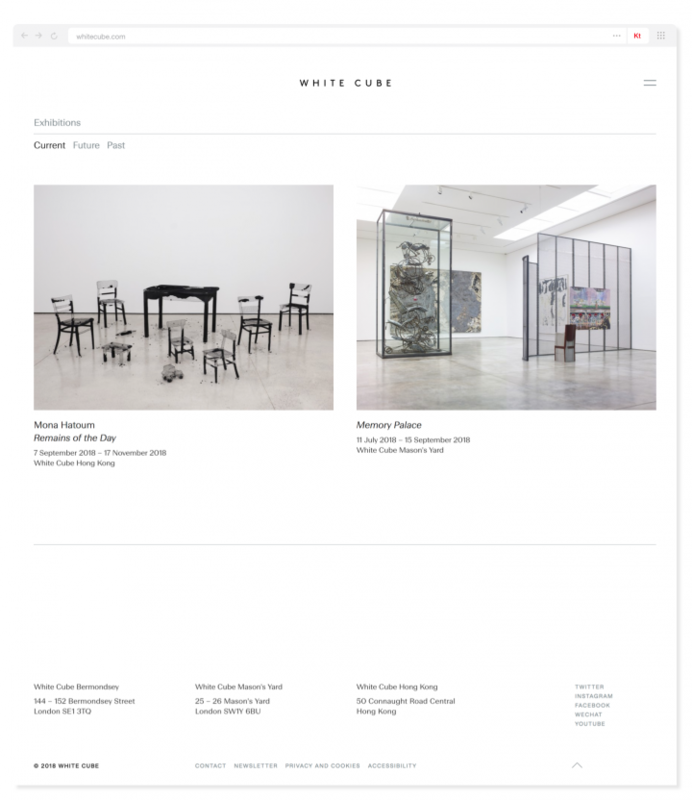 Keepthinking worked with White Cube to realise their vision of a new website, along with the Qi CMS to manage content. The homepage brings to the fore the multiple and varied exhibitions the galleries show, as well as the wide breadth of artists. A featured content module at the bottom of the page, provides White Cube with a further to highlight a specific piece of content. 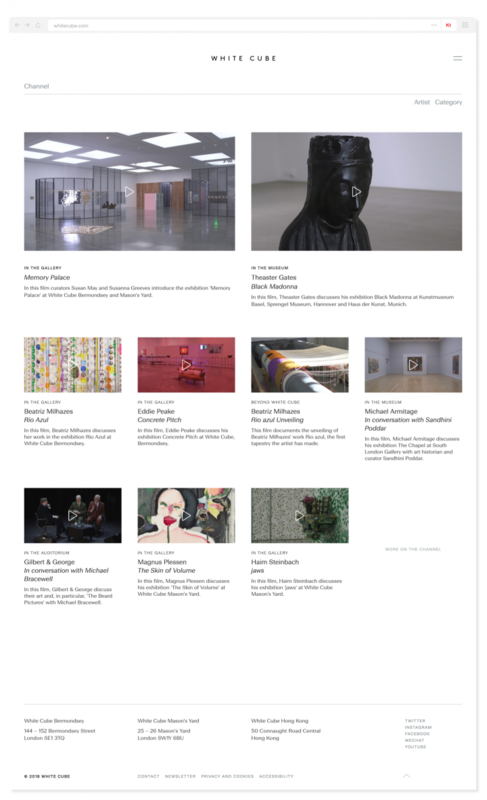 The landing page for the represented artists prioritises the visually colourful and image driven nature of the gallery. Words are kept to a minimum on landing pages, and a single featured artwork is showcased in the artist grid. An individual artist page leads with their work, a single image above the fold. Some text information is shared about the artist, but with the majority behind a ‘read more’, so as to keep the images and the work of the artist at the forefront of user experience. Exhibitions, related content and a list of all represented artists take up the rest of the page. The exhibitions landing page provides the user with an instant appreciation of what is currently on show. The user is also able to view the other content categories of future and past. The repository of historical exhibitions demonstrates the breadth of artistic endeavour White Cube hosts. An individual exhibition page takes the visitor through carefully curated highlighted images and artworks in a carousel at the top of the page. They are provided with information about the exhibition itself; and also highlights of other current exhibitions at the end of the page. With so many exhibitions and artists, the news and events pages are a hub of activity. White Cube categorise their events and news, and sort them into past and current. The imagery associated is always brought to the forefront. 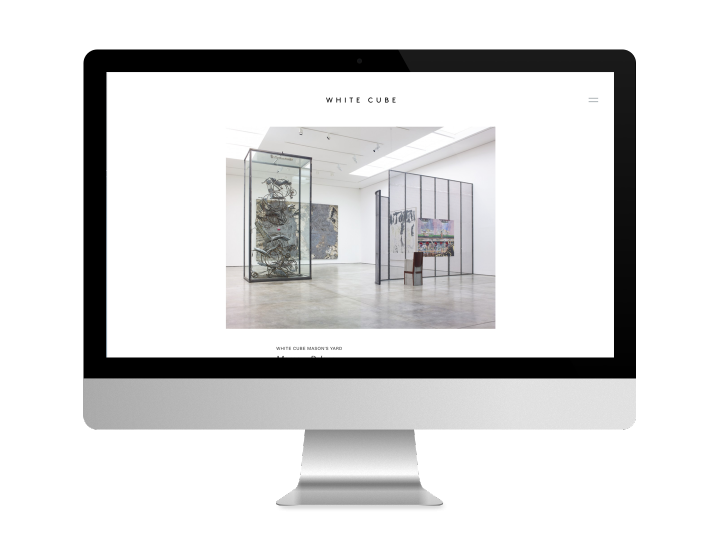 This very visual website also includes a channel, where videos and films of artist work; as well as films made by White Cube themselves, can be shown to the website visitor.